The new Citroën C5 Aircross SUV, which is available to order here at Motorparks, is an attention-grabbing vehicle for several reasons. It boasts a muscular style, for instance, as well as showcasing a unique and assertive character. You will be able to get to grips with so much state-of-the-art technology when behind the wheel of this SUV as well, not to mention feeling assured that the car makes use of 19 handy driving aids. The new Citroën C5 Aircross SUV, a versatile and comfortable SUV is available now from Motorparks Citroën and Oldham Motors Citroën. 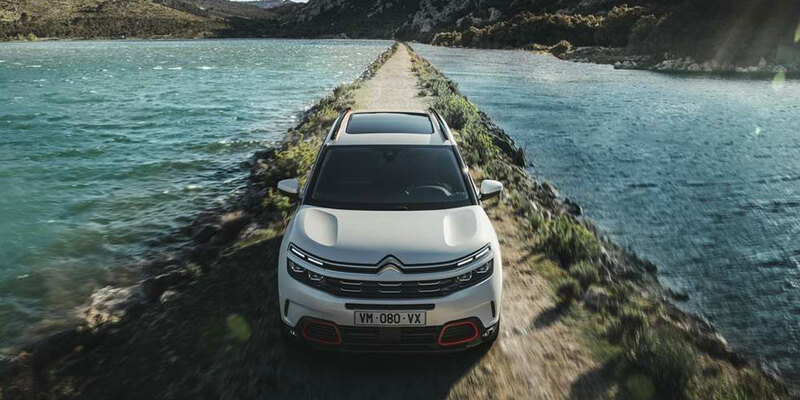 Helping the new Citroën C5 Aircross SUV to get from A to B is a selection of powerful yet incredibly efficient Euro 6.2 engines. The suspension system of this vehicle is also innovative in its setup, it absorbs minor and major surface unevenness alike. Both the driver and passengers are provided with unprecedented comfort as a result, as the system creates a feeling of the car flying smoothly over the road. You're met with an organic and fluid design when checking out the exterior of the new Citroën C5 Aircross SUV. Step inside this hatchback and an exceptionally comfortable interior awaits you. Your eye is sure to be drawn to so many features when looking at the new C5 Aircross SUV for the first time. For one thing, the vehicle features an assertive character made possible by its muscular style and flowing graphics. A high-sculpted bonnet and powerful front-end design are sure to get you noticed wherever you drive this SUV too, while a flowing roof design and rear headlamps which are fitted with a set of LED oblong modules will be vying for your attention as well. Head inside the new C5 Aircross SUV and you'll be presented with elements to be amazed by. There's a 12.3-inch dashboard screen that displays essential driving information within the driver's field of vision, for example, as well as seats set up in a high manner to give you a feeling of control when on the road. Generous and flowing shapes have also been incorporated throughout the interior design of this SUV, while its robust dashboard features a stylish horizontal layout. Another standout element of the new Citroën C5 Aircross SUV's cabin is an eight-inch tablet that comes complete with a capacitive touchscreen. Access it and you'll be able to easily adjust the vehicle's settings, provide in-car entertainment via a multimedia system and much more. This SUV has been manufactured with 19 driving aid technologies too, which include a lane departure warning system to keep you out of harm's way throughout road trips, smartbeam headlights to make it less stressful to drive at night, and a reversing camera with top rear vision that will make parking a whole lot easier. You can make the new Citroën C5 Aircross SUV unique to your tastes and requirements by improving it further with a number of accessories. Keep the car's boot tidy and in an orderly fashion with a luggage compartment cover, for instance, or add an animal safety belt to the cabin when four-legged friends often head along on your road trips. Discover more personalisation options available on the new C5 Aircross SUV and make a general enquiry about this vehicle by contacting us online today. You can also visit us in Greater Manchester at our Oldham Citroën dealership if you'd like to see this phenomenal car up close.